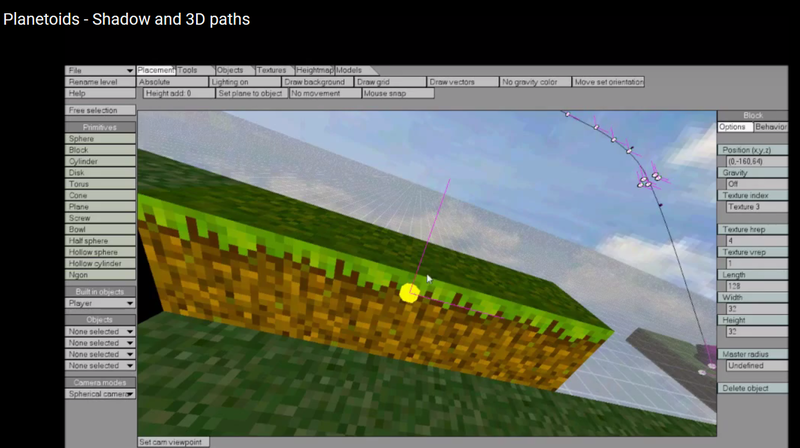 SMF - 3D collisions, animation, materials and level editor - Now works in HTML5! Discussion in 'Work in Progress' started by TheSnidr, Feb 14, 2017. The FBX parser is done. Whenever the end of a key or "elem_props_type" is "_map" it is a ds map and "_list" it is a ds list. So it will be easier to use the data. The elem_props_data_list and elem_props_type_list is synced. Now it is a whole other story to actually try to make some sense of this data. Well, I didn't know there is currently a bone limit, but to clarify, I'm not interested in unlimited bones for models actually... I wouldn't want you to get focused on something that most of us might not need. I'm interested in being able to adjust many bone positions/rotations during runtime or produce realtime samples for things like procedural animation. I'm perfectly fine with it not affecting other bones in the hierarchy. As long as you can reset the bone transform during runtime and it comes at cheap cost - and by cheap I mean you can have many bones doing this and it can run on most PCs. But if it's something that's simply not possible or difficult to achieve there's no problem. Also, sorry if I didn't get the memo, but what's the current state of being able to import pre-made animations from Blender in this engine? If this isn't currently a feature, I would like to add to the voices of anyone requesting it. I got to briefly try out the SMF tool. It's very impressive! It will definitely help many users who are new to 3d overcome/bypass the frustrations of having to learn to rig/skin/animate in 3d software like Blender and Maya. A suggestion: being able to select where you place the next keyframe instead of having it appear halfway between two frames. I will resume my quest for importing popular animation formats as soon as I'm done with the rewrite of the system! With the new system, you will indeed be able to do procedural animation. 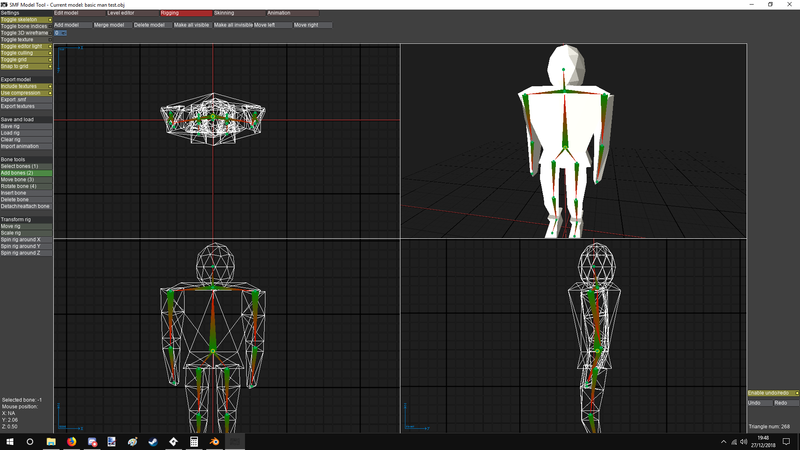 It will have scripts for modifying bones and creating animations on the fly. I will also attempt to make the inverse kinematics seen in the editor available through code. Though the rewrite mainly is to make the scripts more accessible, I'm also having fun overhauling the controls! hippyman, Bart, Micah_DS and 8 others like this. sorry to poke you again. but it was still the same result. FoxyOfJungle and TheSnidr like this. 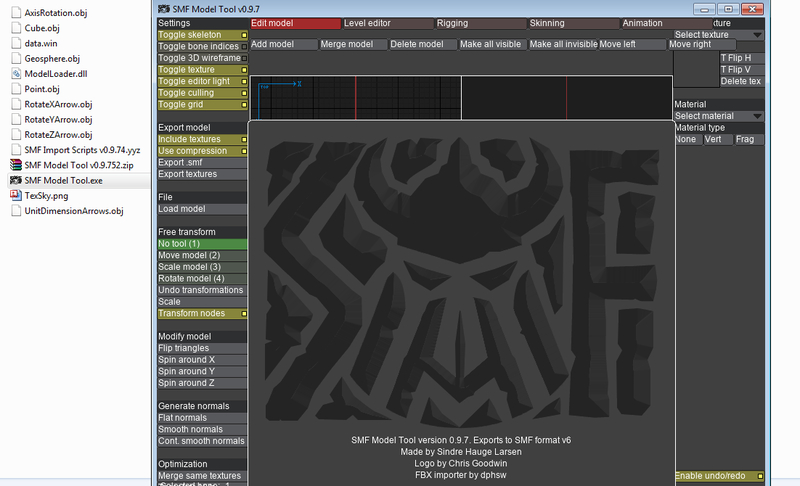 Here's the source to the model tool as it is at the moment, in case anyone's interested. I got pretty far with the rewrite, almost all scripts have been rewritten. Instead of just being an animation engine, it's now more like an animation framework. Creating rigs and animations on the fly is now possible through code. I want to continue working on this, but I can't keep spending as much time as I have been on this project. Updates will be sparse, and as such, I'd like to share what I already have, even though it's not completed. DBenji, Micah_DS, NoobsWeStand and 2 others like this. Thanks a million times over. My suggestion was just a luxury we could all do without and yet you still managed to pull it off. Mad props to you. What version did you use of Game Maker Studio 2 in this project? Because when I click on open a 3d model (FBX or OBJ), this don't works. If it's not too much of a hassle, can you make the ".exe" available to the current editor? Thank you so much, I hope you've read it. I've just spent so much of the little spare time I have thinking about ways to improve this system. I need a break from it, that's all! What happens when you load an obj file? Does it give an error or fail to load without errors? If the latter, check the debug messages it's outputting to see what went wrong. I removed the limited FBX importer in the open source version of the model tool, since I don't own the rights to share the DLL I used. It's a fairly simple format based in json and binary vertex data. Would be a perfect fit for this project, even if it only imports a subset of gltf. TheSnidr and DBenji like this. source to the model tool as it is at the moment, in case anyone's interested. Can you put it on bitbucket or github? So we can help out? To allow potential code contributions to the project. Also, if you need funds to allow push more time to the project. I am sure people interested will help out. And if your brain is in "Ahh-soon-I-AM-FINISHED-with-this-thing!-I-can-start-to-slow-down-now" mode. Or "Ohh-no!-NOT-THIS-again" mode. Swap your thinking. Make a mini game and put in on itch.io or learn something completely new. I'm not on the computer right now, but it gives me an error loading, and then deletes things from the view, like the grid, the model, and so on. Anyway, I just wanted the compiled application, just to use it in my current project. I thank you very much if you can. I loved the idea of putting it on Github. I'm good at interface design, it would be an honor to make a cool interface for the editor! Testing it out and I've come across a problem though, I made a model in Blender and imported it, rigged it, skinned it, etc but when it came to animation one of the meshes in the model had disappeared? Excellent suggestion! Seems like a simple format, will look into it. Another excellent suggestion! Github it is! Gonna polish a bit more, and then put it up there. Tbh I don't really need to make money from this project, so funding isn't the issue. For the past few months I've spent nearly all my spare time working on this. I'd rather spend some more time with my gf, work out and get in shape, and less time staring at the computer. If the model importer doesn't work in the project file, it won't work in a compiled version either! I'll need to know what kind of error you're getting, or even better, send me the model file you tried to load so that I can figure out what makes that different. Thank you! The chest most likely disappears because it has no skinning info. Try using autoskin on the entire model and see if this fixes it! Cow, The-any-Key, DBenji and 1 other person like this. First Image: When I open the model. Second Image: When I click ignore error. Third Image: When I click in somewhere in the window. Attention: the same happens with ".obj". My model works perfectly, I've used it in other programs, and I've downloaded it. I've also fixed the scripts for saving and loading collision meshes to/from buffers! Keep in mind though, the system isn't as "complete" as the old version, not all functions are present. Fernando Garcia, FoxyOfJungle, DBenji and 1 other person like this. 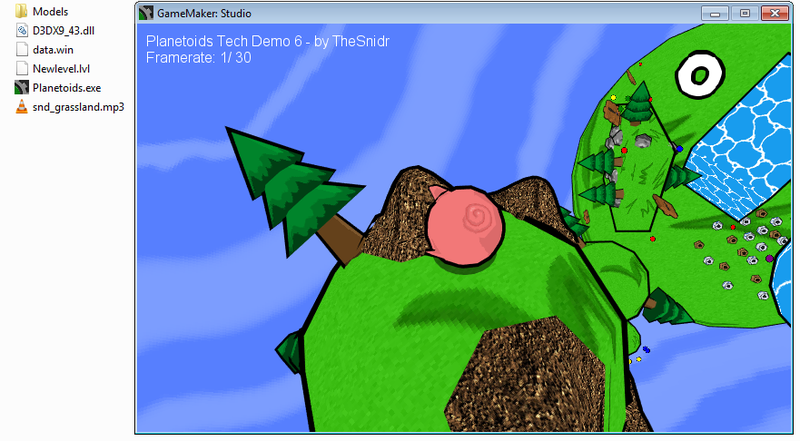 I'm currently in the final phase of separating the collision system from the rest of the SMF environment entirely! The collision system no longer depends on the SMF system. You can feed it your own vertex buffers, using your own vertex formats, and it will generate a collision mesh for you. Spatial hash: A map structure storing sparse geometry data as sections in space. Similar to lattice, except it does not store empty space. Each subdivision type supports ray casting. The method for ray casting on the different types differs, but they all use the same script. The colmesh can be scaled, rotated and translated in real time. To get technical about it, it's not actually the colmesh that gets transformed, but the collision shape that gets transformed by the inverse of the transformation matrix, and then transformed back at the end. This does as such not support non-uniform scaling, all dimensions must be scaled equally. It does also not support shear. There are scripts for writing and reading the colmesh to/from a buffer, giving you total control over how you save your colmeshes. You can now check for collisions between ellipsoids and colmesh! Useful for tall units. The problem with this is that the ellipsoid slides down hills slower than a sphere. Collision scripts no longer define hundreds of arrays for each collision. It now uses local variables instead, which is how it always should have been. I got a bit crazy with the arrays in my quest to shorten the code as much as possible, but then I recently found out that this slowed the system down drastically. I've gone away from arrays as much as possible. No more buffer usage in real time. Buffers are slow. Instead, I use grids, maps and lists wherever they fit best. Saving and loading takes a little more time because of this, but in-game speed is much more important IMO. You can perform collisions and ray casting within a region. This is useful for complex collision checking with multiple checks and ray casts, since you only have to get the region once. The most costly part of ray casting is looping through the regions the ray crosses, so this is a super way of optimizing when you only need short-range rays. The file also includes some optimized scripts for primitive collisions (sphere-sphere, sphere-cube, sphere-torus). There's also an early version of another standalone asset called SMF Basics, which contains scripts for manipulating vertex buffers. It has a basic obj-importer, some scripts for creating normals and tangents, and aims to be a low-level tool for model processing. Mert, DBenji, Dacker and 6 others like this. Newest version doesn't work. It crashes when I try to export .smf files. global variable name 'editorModelName' index (100202) not set before reading it. Also it won't allow me to Save rigs nor load rigs. When I click on them nothing happens. Do you think you could link all versions of this program? Nevermind, went through the thread and found the fix. 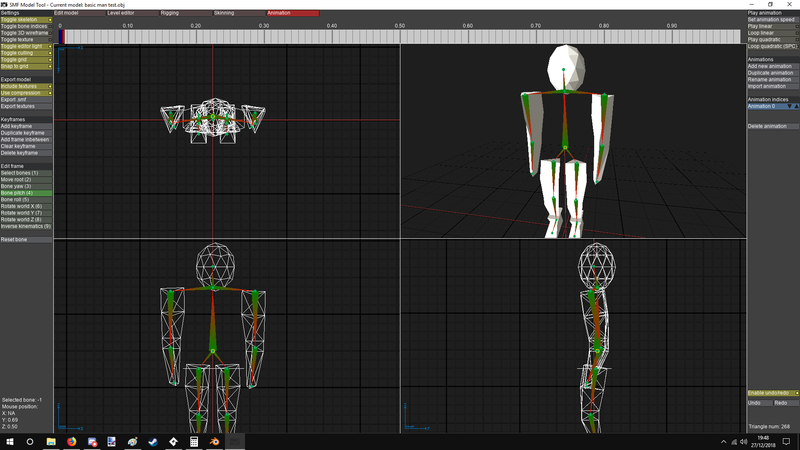 How is the FBX importer coming along? I want to thank you, BIG TIME, for creating this system. It has breathed new life into my love of video game design with GameMaker. The video you posted on your YT channel made me immediately want to know more. I'd like to see a video where the character is placed into the level (even if it's a simple maze) and walking around it; while showing the steps that make this happen. If there is already a video can you send me a link? Again, love your work and thank you very much for it! Thank you, @misterprickly Your comment means a lot. I'd love to make an elaborate video series on how to use the SMF system, excellent suggestion! There is no such video as of right now. I got a bit burnt out by my ambition to rewrite the system, so I haven't touched it for a month or so. @SweetCelestia made an excellent COLLADA importer that he has allowed me to incorporate into the SMF system, so that'll be my next step. I haven't managed to get an fbx importer up and running. I really liked the program that made "Planetoids" Level editor .. Much more "Snidrs Model Format" His evolution to rewrite the system ... WOOW .. I admire you "TheSnidr"..
EMPixed and TheSnidr like this. I haven't looked in here in a while, and I must say—the progress is insane to see! But then, a lot of time has past since I last checked here, so yea. Although before I did ask before about commercial use and whether or not we were required to give credit to you, Snidr, if we make games usin' SMF(Snidr's Model Format)—yet I never thought to ask about what license(if this software will use any) SMF would use and even then would we would be able use SMF with or without any obvious hints to it. This comes off as a tad "shady" or kinda stingy to even ask, but one—just tryin' to be VERY careful where I step, copyright and licenses have made me super gentle about them cause of the complications, so simply; this is why I ask.....really, it's all about the laymen's terms—and two—personal problem that'll come off as if I'd never credit someone for their hard work, really; just hate how some people will essentially demand credit—but from what I recall, you approved the use of SMF in commercial works and said there was no need to credit(I'm strange as I'd credit cause of this here; someone chose to NOT demand credit—but by no means do I mean malice about ANY of this, just tryin' to cover all corners really) but of course it's common sense to not claim to have made somethin' someone else made—obviously. I digress though, gotten the clarity I've needed and really my "quick"(yea, I know, "quick" my back side) question is this; What license would SMF use(if any) and would it be completely flexible with someone's works and copyrights and such? Any issues with this at all? In terms of my constant nag about this; my deepest apologizes. Wanted to provide the general questions about this and you DID say before "no strings attached", but again—I just want to cover all the corners I can about this kind of stuff. Again; pardon my likely paranoid soundin' questions. I remember a while back, around 3-5 years that the Raspberry Pi would brought into the mix about GMS Module support. Alas, I voted against it, regret that, but more importantly—it appears no other word has been brought up about it in any major form. Which is a disappointment but understandable as there's likely more important things in GMS or rather GMS2 now to work on. The point that I'm gettin' to though is SMF makes me wonder how well the 3D potential would be for GMS2 on RPi, namely the RPi3 and how well it'd run with that present. Along with SMF in use, I imagine it'd be an easier take to operate in 3D on a RPi3, but nothin' of modern high-quality mesh work. Low-poly meshes would obviously work on a RPi3 due to the fact it's an easy render typically, but due to the technical differences—there'd be problems in other places and would likely just pile onto the issues that were there prior. It does really make me wonder though how well this all could function on a RPi, preferably the latest(RPi3 as of this post) and what all could be done on it. Looks like it's been a fantastic time to learn Blender as Blender 2.8 is around the corner, have an interest for VFX/3D VFX, game design in general(both 2D and 3D; my interest has been in this for about a decade—learnin' method are botched af though, my fault nonetheless) and SMF is so damn polished at the moment, isn't even finished that it's insane and hype worthy to see GMS1/GMS2 get a 3D upgrade from someone that's been in this community for well over a decade himself. Snidr, seriously—thank you for this as it's been fun to watch this grow and improve over the past year and a half. But enough of my praise, this is bound to get more and I've already expressed mine! All-in-all, I've eyeballed this and kinda stayed away and wow; glad I did cause there's so much more to see! Hopefully my abundance of questions didn't get too ridiculous—thought of these somewhat on the fly and thought I'd just toss them out there! Either way, the more you watch, the better this project gets! I strongly advise to use!